We all try to save money wherever we can. So when a powerful storm rips through Lexington and damages your roof, DIY installation may come across your mind. It sounds great initially. You get to save money on materials and cost of labor. Unfortunately, the reality is that most DIY roof installation projects wind up being more expensive than professional ones. How is that possible? Think of it this way: You already spent money the first time on materials and did even further damage to the roof. Now you’re forced to hire a professional roofer to do the job the right way. In a sense, you paid double for the roof installation. 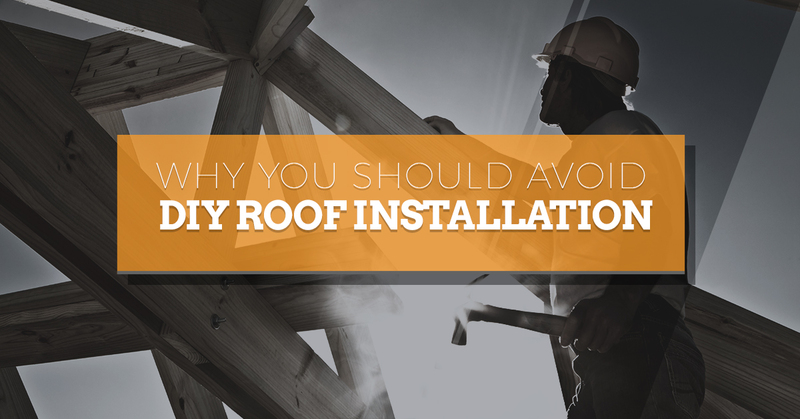 Keeping reading for five reasons to avoid DIY roof installation. Your roof may not be up to code – Some homeowners mistakenly think that since they can learn how to change a tire on YouTube, that they can do the same with installing a new roof. But there isn’t exactly a one-size-fits-all instruction manual for roof installation. In Kentucky, each city has its own rules and regulations. Keep in mind that if you install a roof that’s not up to code, it may not pass inspection in the future. This could significantly reduce the sale price of your home or prevent it from selling altogether. Your root may not be secure – The average homeowner doesn’t usually understand the intricacies of roofing materials. For example, they must be layered in a precise way, while the peaks must be covered properly to direct water down the roof. In Lexington, wind-driven rain can wreak havoc on susceptible roofs. It’s all the more reason to be your project in the hands of experienced roofing contractors. Your roof may not be warranted – Plenty of roofing materials come with a limited warranty. The kicker? The warranty only applies to materials that are installed correctly by a licensed roofing company in their network. Your roof may not last long – Let’s go back to the money-saving argument. Some homeowners choose DIY installation because it serves as a “band-aid” or “stopgap” approach. Their thought process is that they’ll “get by” with a DIY-installed roof and then explore professional roof installation in five years. Frankly, such a strategy could cost you thousands of dollars. Your roof may not look good – Along with landscaping, roofing is a significant part of your home’s curb appeal. Keep in mind that a poorly done roof installation will lead to expensive repairs and even damage the facade of your home. At Sands Roofing and Construction, we can take on just about any project. Whether it’s brand-new installation or roof repair, Lexington and Columbia residents trust us to do a professional job. We’ve delivered for years and we will continue to do so, going the extra mile with each of our customers. Rest assured that we only use trusted brands such as GAF, Certainteed, and IKO. What really separates our roofing services is that we have licensed insurance adjusters on staff to ensure that your claim is handled efficiently and properly. Do you have insurance work that needs to be performed? Our roof repair services pros at Sands have a great relationship with all major insurers, making the process hassle-free. Don’t put yourself in an unnecessary bind with DIY roof installation. Call now for a free inspection and evaluation.